Home » Rob Roy`s Sporran and Skene Dhu. Rob Roy’s Sporran and Skene Dhu. Sgian dubh (other spellings: sgian Dhub, skhian dubh, skein dubh or skene you or skean dhu) is a traditional Scottish knife, also known as “stocking dagger”. Since the 18th century the Sgian dubh belongs to Kilt equipment of the Highland Scots. It was covered worn as it was the Scots prohibited by the Disarming Act to bear arms. The handle is traditionally made of ebony, the scabbard with leather coated wood. The metal fittings are made of silver plated brass. The name is Gaelic, meaning “black dagger”, although it is not sure what black refers. A sporran (Scottish for “purse”) is part of the traditional clothing of the inhabitants of the Scottish Highlands. MR. SCOTT TO MR. CONSTABLE. “ABBOTSFORD, 11th October 1817. It is doubtful whether we may assert this sporran to be the same as that described at page 392 of the novel of Rob Roy, but we cannot refrain from quoting the passage so appropriate to this gabion. Rob Roy’s skene dhu is a strong dangerous-looking weapon, 8 in. in length, including handle, and 1 3/8 inch at widest part of blade. The handle is cross hatched by deep cut lines and mounted with silver. The end is set with a pale-coloured cairngorm which is drawn full size. The blade has the maker’s name, M’Leod, engraved upon it. 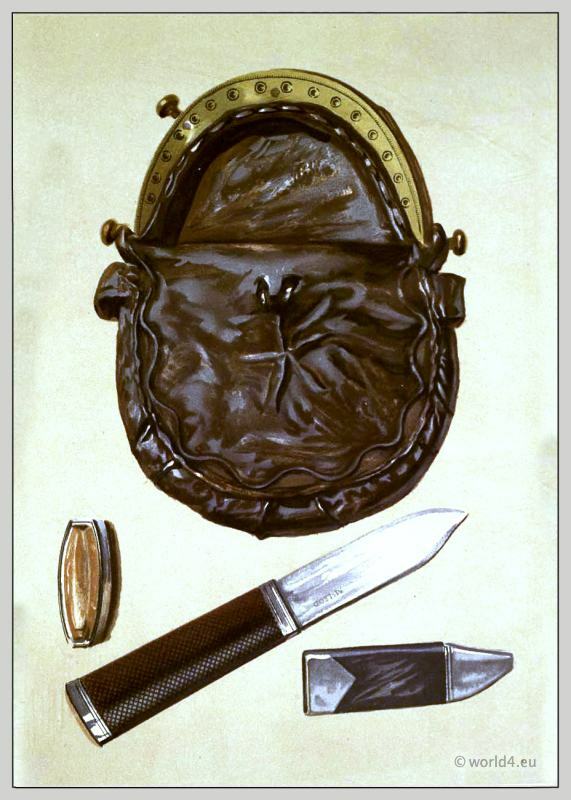 The sheath is of black leather, mounted at both ends with broad bands of silver. The skene dhu, or black knife, which formed part of a Highlander’s equipment, was used for the purpose of despatching game, or for other servile purposes for which they objected to use their dirks. Unfortunately nothing is known of the history of this weapon, nor is it known how it came into Sir Walter’s possession. The Purse of Rob Roy. Toadstone Amulet. Helen Macgregor`s Brooch. A Polygar`s Knife, A Malay Kris, Tartar Sword, Rob Roy`s Dirk. Rob Roy parting Rashleigh and Francis Osbaldistone. This entry was posted in 18th Century, Accessoires, England, Scotland and tagged Abbotsford, English history, Scottish, Sir Walter Scott on 7/16/13 by world4.